On Sunday 21st April 2013, Enter CIC performed in the Old King Coal Festival at Beamish, The Living Museum of the North. 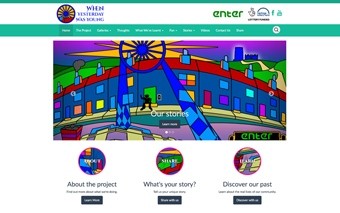 The festival took place over the weekend and was designed to mark the 100th anniversary of peak coal production and to celebrate the North East’s mining heritage. There was plenty to see and do all around the Beamish site including steam engines, quoits, banners galore, family games, costumes characters, carousels, behind the scenes tours and of course Enter CIC’s fabulous performances. We were delighted to be invited to kick start the whole Sunday parade. Enter CIC initially took to the Beamish streets at 1.45pm to kick start the banner parade. Our students performed in the town centre (pictured left) and as they started to perform their songs they were quickly surrounded by vast crowds (general public) who marvelled at their ability to sing acapella and to sustain such complex harmonies (especially given the fact that it was an outdoor performance). The event illustrated how talented our upper school are and just how adaptable they are as performers. After performing in the town centre, we joined in the banner parade. 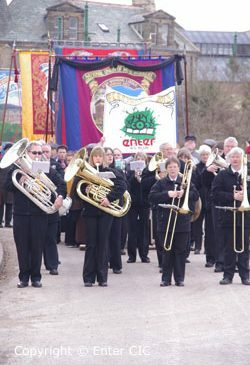 Enter CIC fell in behind the band as the band marched past playing an array of recognisable mining songs (pictured right). It was a privilege to be involved in the parade. The parade went through the town and up to the Wagon Way. As we looked behind us all we could see was an array of colorful banners, hundreds of school children and an array of people on bicycles in period costumes. This gesture was noted by the general public and many of them approached us to say how impressed they had been to witness our young people take off their hats. Enter CIC took to the stage once again and performed a scene entitled ‘The Miners Strike’ from the Wind Road Boys (pictured left) which depicts the emotional response of a group of miners who have just been informed by the mine owner that they will be working for lower wages! After performing at the Wagon Way we headed for the Pit Village and stopped off at the Chapel to perform more songs from the show. It was wonderful to hear the harmonies carry onto the Pit Village streets and once again the Chapel quickly filled with members of the public wanting to catch a glimpse of our performers. To conclude the event some of our cast performed scenes from The Wind Road Boys in the School room and Pit Cottage. Both scenes were well received. The school scene had the audience in stitches of laughter, but the pit house scene which depicts the heartache of a miner who has lost his son in a pit disaster drew tears from the members of the public who witnessed it. This type of contrasting response illustrates the emotional roller coaster audiences experience when they watch the full production of The Wind Road Boys. 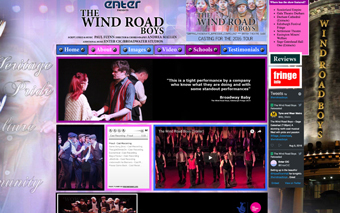 Throughout the day we distributed an array of marketing material for The Wind Road Boys production. We would like to extend a huge thanks to Beamish Museum. We all had fantastic day and thoroughly enjoyed the event. 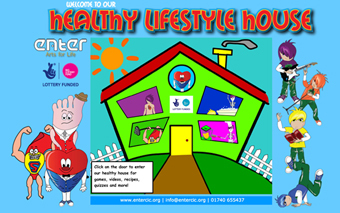 I wanted to say a massive thank you for coming along to our event; it was great to have you here and the young people really added to the day – they are such a good bunch and so talented!